Cooking gluten and dairy free… because everybody deserves a cookie! This is what we are eating tomorrow. 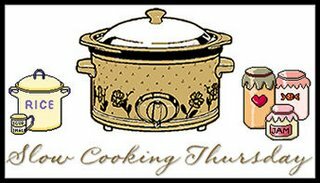 Head over to Sandra’s for Slow Cooking Thursday and see what is in every else’s crock pot! In a slow cooker combine all ingredients and mix. Cover. Cook on low for 7 hours or on high for 3 1/2 hours. Discard bay leaves before serving over cooked rice. Optional: You can stir in 1 pound of frozen, peeled and cooked shrimp that have been thawed about 15 minutes before the end of cooking time. Serve when shrimp is heated through. This entry was posted in Chicken & Turkey, Dairy Free, GFCF, Gluten Free, Slow Cooker. Bookmark the permalink. YUM! That sounds really good! I’ve always wanted to make jambalaya. I found your link on organizing junkies site. Your post caught my eye because I also eat GF and dairy free. Thanks for posting! Your donations help keep angelaskitchen.com running. Thank you!